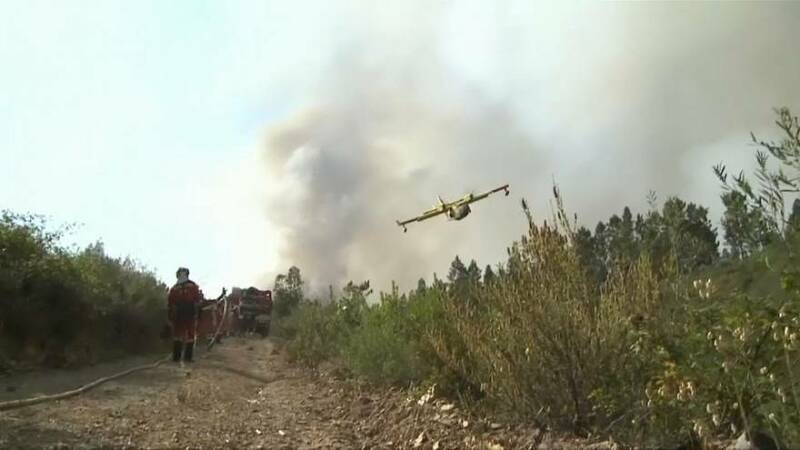 Reports that a firefighting plane crashed in central Portugal have turned out to be false. Local media reported that a Canadair aircraft had crashed near Pedrogao Grande, the centre of the country’s deadliest fire on record, which has killed dozens since Saturday. Witnesses reported an explosion soon after a plane flew over, but it appears that may have been gas supplies igniting. The civil protection agency said a helicopter searched the area after the reports but nothing was found and there are no reports of a missing plane. Firefighters battling the huge Portuguese inferno say the blaze will be under control in the next 24 hours if the wind remains favourable. More than 1,500 firefighters supported by nine water-dropping aircraft are working round the clock to douse the flames. The wildfires, the worst in Portuguese history, have left at least 65 dead and injured more than 150. The carnage began on Saturday when lightening hit a tree, sparking a blaze of dreadful devastation. Portuguese environmentalists blame poor forest management and bad politics. They claim the planting of highly flammable eucalyptus, which have now outstripped pine and cork oak, are the reason the fires are so intense. Burning eucalyptus bark also floats on the wind, spreading the devastation.